I am introducing a new portion of my blog entitled 12 Lighthearted Questions. The idea being that I send out 12 informal questions to a variety of woodworkers on the blogs and publish their responses, unedited. Hopefully it will provide a unique perspective into some of our favorite woodworkers and to serve as a way for them to share a little more insightful information about themselves, with us, the woodworking community. Why 12? Well, there are 12 inches in a foot, 12 eggs in a carton, 12 steps in the program, and 12 seemed to be the right number of questions that a woodworker might actually take the time to respond to! 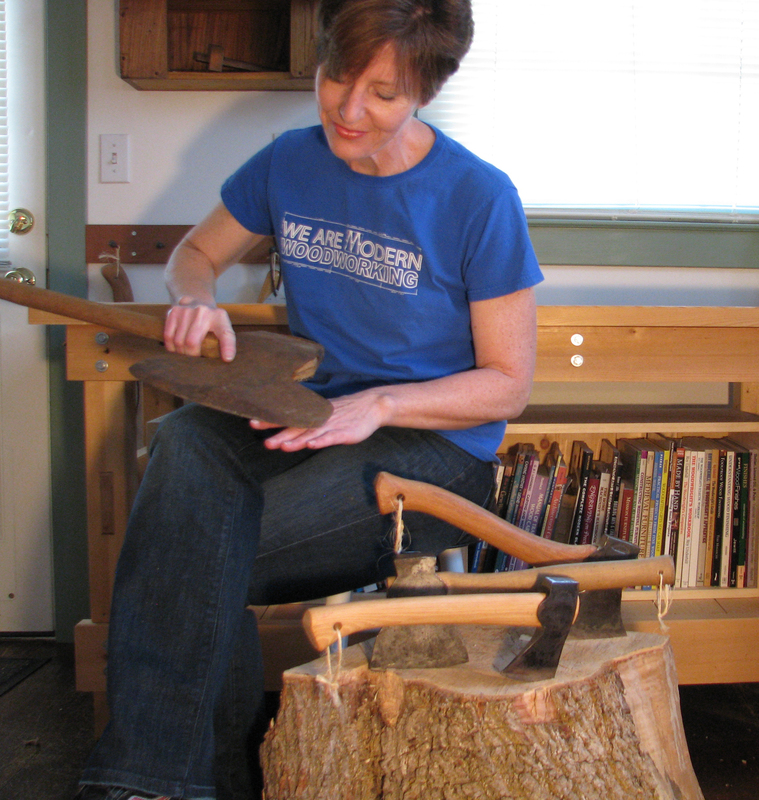 6- You seem to use a lot of pine, which most woodworkers won’t touch. What’s your favorite wood to work with? I do love pine, especially the smell. My favorite wood is Pennsylvania cherry. Its workability, warmth, and depth are superb. When it’s finished, it glows. Plus, I can get it for a buck fifty a board foot. I’m never moving from this area. Apparently this is Kari's secret to keeping her nails looking so nice! Thank you, Thank you, Thank You to Kari for being such a great sport and sharing her “innermost” secrets! And Thank You for all the years of amazing blog posts! I can’t imagine anyone reading this does not read Kari’s Blog, but please head over there and show her some love! Let me know what you think and hit me me up with comments and suggestions. I’d love to hear from you. One of the reasons I looked to Sketchup was the ability to create templates for the pieces. While the pieces themselves were not really that complicated, it was extremely important that they not only be accurate, but also symmetrical. Templates seemed to be the best way to go. I have used story sticks in the past but I had never really created or worked with templates. I did my research, watching the wood whisper’s videos and getting advice from my friends on google+. I own a design company, so I am fortunate enough to own a 48″ plotter. Making full size templates super easy. Printing full size in Sketchup was another story. I struggled with this for several days. But luckily, again, I was assisted by my friends on google+, including none other than Bob ‘Sketchup’ Lang. 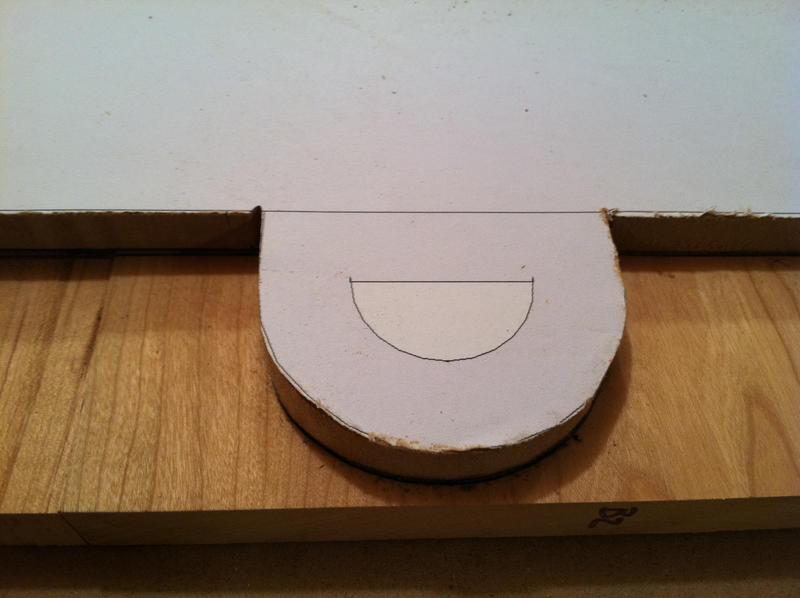 At my local lumberyard I invested in several sheets of 1/2″ MDF. As always, I brought my trailer. It’s bed is 48x 60. 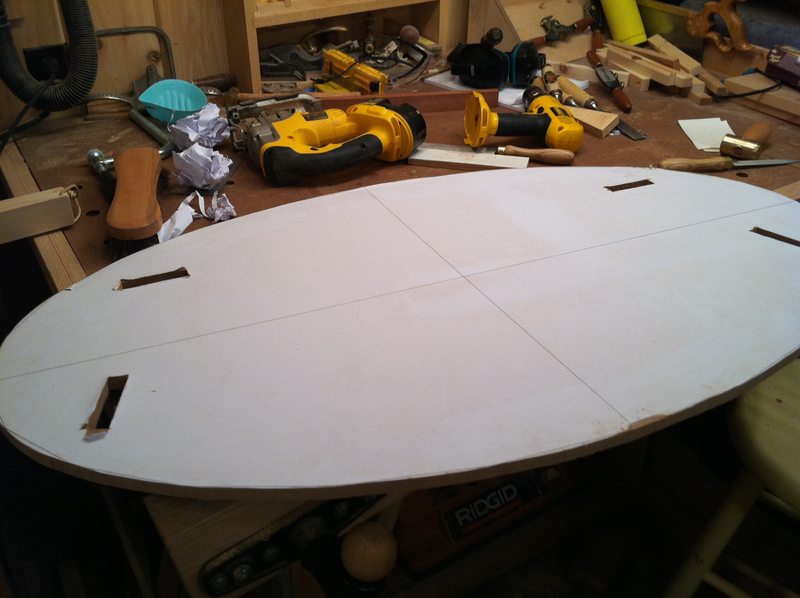 A perfect size for most of my needs and wide enough for a sheet of ply, or so I thought! 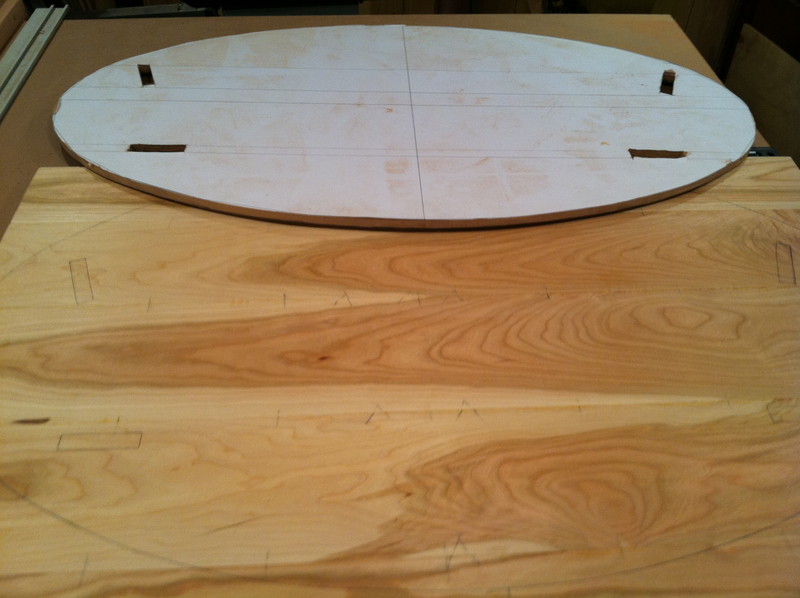 Since my shop space is a premium I usually have the sheets cut in half for easy handling at home. They cut the 1st piece but when we went to put it on the trailer it wouldn’t fit. What the…? Anyone, anyone? 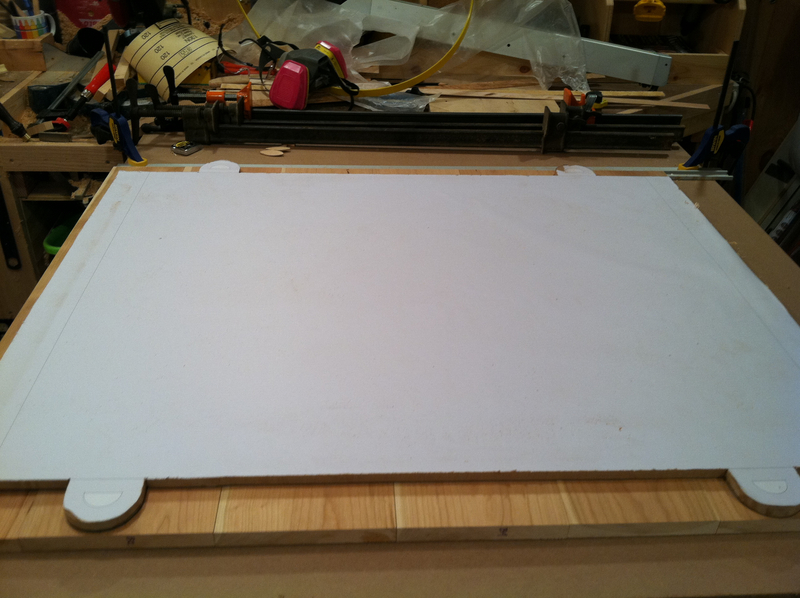 Well it turns out that a 4×8 sheet of MDF is actually 49″ x 97″!! Who knew? Ok, well maybe you did, but I didn’t and the guys at the lumberyard apparently forgot. So, a couple of cuts later I was on my way. With my full size prints, my new MDF and a can of spray adhesive I created my templates. I must admit, the simplicity of the shapes made me feel I was being a little silly, and I could have laid this out by hand. But given the curves and the need for exact placement of the through tenons, this made sense and prove to be a worthwhile exercise for me. And besides I was taking true advantage of sketchup by figuring it all out ahead of time. More on MDF in an upcoming post.